I´ve installed the Azure SDK 1.2 on my computer and tried to debug the application. But as a result I received the following error message. Reason: Instead of the SQLExpress Installation I installed a SQL Server 2008R2. Windows Azure Tools: Failed to initialize the Development Storage service. Unable to start Development Storage. Failed to start Development Storage: the SQL Server instance "˜localhost\SQLExpress´ could not be found. 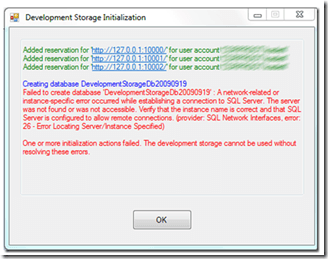 Please configure the SQL Server instance for Development Storage using the "˜DSInit´ utility in the Windows Azure SDK. Keep in mind: I´ve installed a SQL Server 2008R2. Reason: He tries to find the SQLExpress Server but this Server doesn´t exist. NOW it should be working!